How did a heavily-armored dinosaur end up at the bottom of the ocean? Although a few dinosaurs were adapted to live underwater, most dinosaurs were landlubbers through and through. And perhaps no dinosaur had less business going for a swim that this fellow, the heavily-armored, 13,000-pound Ankylosaurus. 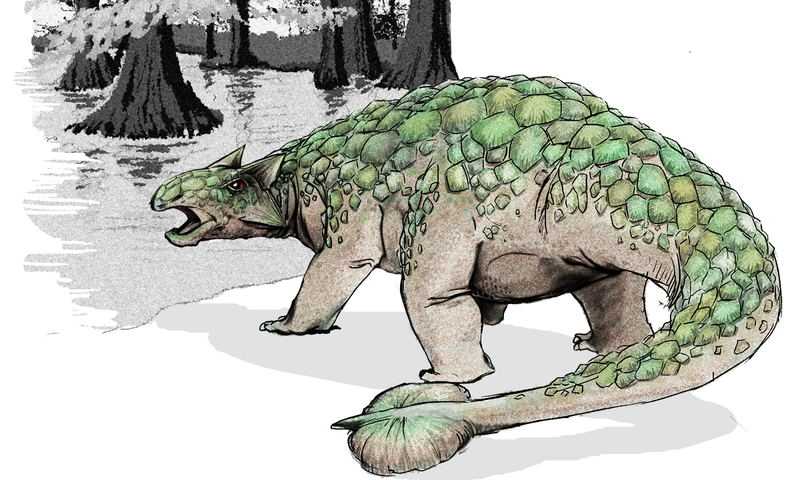 This ankylosaur must have lived along the coastline of the great Western Interior Seaway which once split North America into two. But that was many, many miles away from where the skeleton was found. Exactly how the dinosaur died is unknown, but...the carcass undoubtedly floated upside-down through the sea. The gases from decomposition gave the body enough buoyancy to travel-what paleontologists commonly refer to as a "bloat and float" scenario. For those wanting to learn a lot more about this strange new find, there's an hour-long lecture video at the link. Via Dinosaur Tracking. Artist's conception by LadyOfHats.